(or longer in some cases). Remember Mississauga politicians are some of the highest paid in Canada - so act like it matter how good they are. It is also a time to judge candidates by how much effort they have put into presenting or dressing up their table. Really think there should be a prize at these meetings for best presentation. And should bowls of candy be considered a bribe? in the 2010 Mississauga elections, 11 showed up. based on their appearance on the City web-site listing. Here are their tables to judge. Oddly there are a few candidates tables pictures missing. Oh, they can be seen in side shot - empty. As the candidates are in fact applying for a job and these meetings are like the job interviews with the public as the judges. - then shouldn't they have their names removed from the ballot? how can we expect they will show up or even try to do the job if elected? Candidates for Councillor Ward 10, tables. Better showing for candidates for Councillor. What is this - the wrong use of the Mayor by a candidate or is he part of Team McCallion? 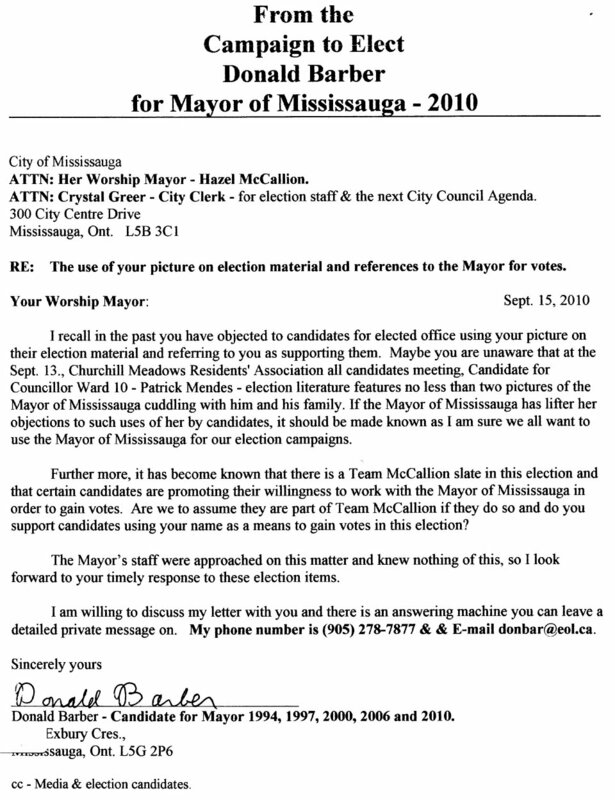 Hazel McCallion has in the past made it clear that candidates were not to use her picture in their campaigns or claim an endorsement from the Mayor. Now what do I see, not once but twice in the same pamphlet! By the way is Patrick Mendes using the Mayor's dress colours for his campaign clolours? And if you want to hear his words about who's team he is on - click here. Wrote a letter to everyone about this too. Trustee English Public - 9 & 10, tables. Trustee English Separate - 9 & 10, tables. Some of the rules and procedures sent to candidates. Hello to all the Candidates. September 13th is coming fast and we thank all the candidates who replied to our letter. We have a draft agenda prepared, however with a small number of candidates not giving us an answer, it could be subject to change. We would appreciate the candidates coming at 6:30 p.m. to set up their table. The table is 6’ long with no chair. Please do not display more than one lawn sign and you may display all the literature that the table will hold. In lieu of literature, please have business cards or some printed material with your name, email and website. The tables will have your name on them as well as the chairs at the front of the gym. There will be large signs on the wall indicating where the different designations will be. The draft shows the estimated times. All Candidates will be limited to 3 min. max. There will be no question period. to come and either pick up material or ask questions. The Gym will be set up with candidate tables around the outside wall. We have 9 registered candidates for Trustee English Public. 4 have responded to invitation and are coming. The balance have not been heard from. We have 9 registered candidates for Ward Councilor and 7 responded to our invitation and are coming. 2 have not answered. 7:10 pm John Briers President opens the Meeting. 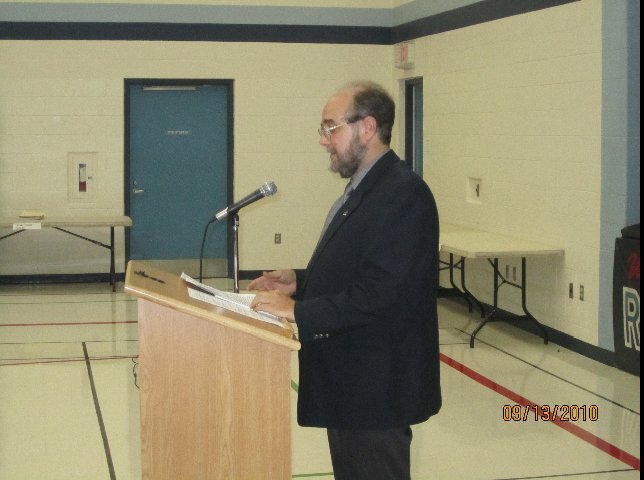 7: 15p.m John Briers asks Lisa McLaren Director to introduce the candidates for Trustee English Public. The order or speaking will be drawn out or a box at the time, as will all speakers following. 1 Min to introduce and 3 min. for the speaker. 9 X 4 min = 36 Min. 7:51 John Briers asks Carla Casanova Director to introduce the candidates for Trustee English Separate. 1 min to introduce and 3 min for the speaker. 8:01 John Briers asks Debbie Curic Treasurer to introduce the candidates for Ward 10 Councilor. 8.37 John Briers to asks Brian Sullivan Director to introduce the candidates for Mayor. 9:21 Tony Cuifo Past President to thank the Candidates for coming out to meet the residents. The Candidates will return to their table. 9:23 John Briers President to direct the residents to stop at the candidates tables for information and a short chat. THIS TIME TABLE IS ONLY IF THE CANDIDATES THAT HAVE NOT REPLIED SHOW UP. Just inside the gym we will have the association table. This table will be looked after by Nadine Moy Director. CMRA members are expected to help out at this table when not busy doing other duties. Angela Longerich Secretary will be the official time keeper assisted by Carla and Debbie when available. Tables are being rented from Action Party Rental. Flyers are going out through both school systems. School Principal is letting us use the sound system. Over views taken at different times. and bragged about where she was before. jump for the bucket game. she draws the name of the next speaking. At least she can do two things at once. or speakers don't present to audience the best image as they speak. Some shots do look bit odd but do represent the emotions they put into their speaking. Haven't got pictures of everyone as I moved around. even if what they say has a pasting acquaintance with the truth. Yes, not a fan, still interesting photo, in its own way. What is going on? Promise is a Promise. of the best quotes of the evening about City staff. great Mississauga at end - crowd goes wild. when comes to keeping to the time limits for speeches. The 3 minute limit was stretched to 4 & 1/2. - what are we, spam sandwiches? Not listening to what said? & guess who getting in picture - again. Thank you Churchill Meadows Residence Association officers and members for inviting us this evening. Thank you residents of Ward 10, friends, visitors and co-candidates. My name is Danny Galang and I am a candidate for City Council Ward 10. For the past years, I have served and protected the rights of the people as a Labor leader. I have involved myself in changing people’s working environment through fair wage increase and eliminating workplace violence. Currently, I am involved in fighting for RRSP protection, not getting lost in case the economy collapse as previously occurred. I have a degree in Bachelor of Science and I am a licensed Electrical Engineer/ Contractor. Why am I running for your Ward 10 council? This community is my children's future; as it is your children's future and I want to get involved with shaping that future. I live and love this community. I believe that a good council can only best understand and represent its community being as he or she resides within our community of Ward 10. I am your neighbor. Your problems or concerns are our problems. I understand your concerns such as speeders, garbage, lack of frequency and number of transportation and community safety as I see it everyday. These issues are here and have not gone away. We need to find ways to work together with your councilors, community associations and your neighbors to find solutions to our regions growth. By implementing sustainable development concepts to protect our environment and solve transportation problems, we can build a favorable community to increase safety, responsibility and movement. Ward 10 is a unique and dynamic community and we have a real opportunity to plan and control our future. I firmly believe that Council Members are involved citizens of the community and also your voice in City Government. I believe that the government is only as good as the people involved. We can make this community good because I along with the help of my family and most importantly my community will be involved. If elected, I want everyone to remember that I am just an ordinary citizen, like you. I am not only running as your councilor but as your fellow Neighbor who will listen to your concerns and extend a voice to those who feel their opinions are not heard. This is my community, this is your community - Ward 10 is my home. October 25th will reveal the next councilor of Ward 10. Please choose wisely who you believe is not only deserving of the position but will serve this community selflessly and will put their fellow citizens ahead of their political agenda. I ask for your support during this election and your vote on October 25, Should you have any concern or comment I am here to listen. We may not always agree or disagree on every issue but I can definitely ensure to you that I WILL LISTEN. Thank you and goodnight.